Lalit Narayan Mithila University is one of the top University in the State of Bihar. Students around many districts of Darbhanga like to study from this university. Mithila University name is known by every one of the Lalit Narayan Mithila University. This University provides a course on Regular & Distance Mode through this post going to update you about the DDE LNMU Distance Education Exam Dec 2018 Exam fee detail. 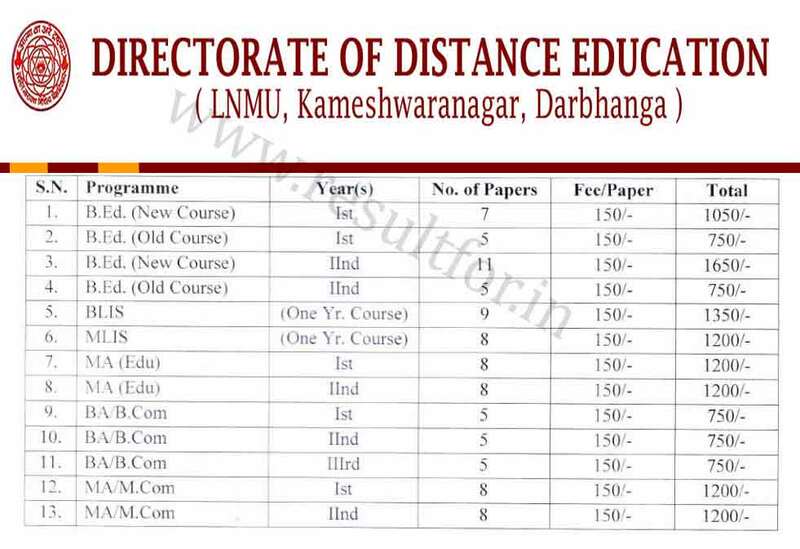 If you are also the students of LNMU DDE then you may try you find out DDE LNMU Distance Education Examination Application Fee for Dec 2018. Anyway here going to update you what is the fee and from when and where it can deposit without late fee and with a late fee. Let’s give a view on a detail of Directorate of Distance Education, L. N. Mithila University Exam Fee 2018 for December Session Examination. Students who got admission in BA/MA or B.com or M.com First year as well students of the Second year and final year have to submit their examination fee. Examination fee can be paid by online and by the Bank Draft. Students are suggested to avoid any late fee suggested paying examination fee for December session last by September. After the September aspirants have to pay the late fee which can be varied as per days of late. Students can give an overall idea about the examination fee and date of submission without late fee and with the late fee. The Directorate of Distance Education in Lalit Narayan Mithila University was established in the year 1998. L.N.M.U Darbhanga was the first Director in-charge of the Directorate of Distance Education. Starting Distance Education from session 1998-99, in consultation with the Advisory Committee which was duly constituted by the University. Aspirants are also suggested to keep in with us for all latest update about the Lalit Narayan Mithila University. If you wish to know any detail or have any queries then ask through the comment.